CAVS PlayCDG KJ Deluxe 64 LT is a professional karaoke software that brings the power and performance of digital karaoke in Windows 7 - 64bit system. Designed exclusively for the 64bit system, the software is fast and capable of playing all common karaoke songs including CDG, MP3+G, MCG, ZIP, AVI, WMV, Super CDG, etc. directly from hard drives as well as discs. The program also records and writes to blank discs, has standard dual screen feature (Control + TV), and manages unlimited number of playlists, file folders, picture files, background videos, etc. The program can also display the titles and artist of songs in all known fonts, such as English, Russian, Spanish, Chinese, Japanese, etc. Its features are well suited for professionals who need versatility, mobility, and power. CAVS PlayCDG KJ Deluxe 64 LT comes with a new 3D Customer Interface that can run on top of the KJ Control Panel. This interface is simple, intuitive, and designed for operation without a dedicated professional. The 3D Customer Interface can also be easily customized (example) with various logo and design. For details on how to use the 3D Customer Interface, please go to the User Manual. CAVS PlayCDG KJ Deluxe 64 LT comes with support for standard Touch Screen monitors (HP, Planar, A-View, etc.) to display the KJ Control Panel or 3D Customer Interface. The combination of the touch screen monitor and 3D Customer Interface is an instant hit at bars, clubs, and restaurants. It entices customers of all ages to try the touch screen to select a song or simply satisfy their curiosity. It also expands your option to purchase a laptop for your location and yet when needed, disconnect the touch screen monitor and use the portable laptop for your road shows. CAVS PlayCDG KJ Deluxe 64 LT connects to your hand-held devices such as iPhone, iPad, and Androids. It transmits the song list to the devices wirelessly, and in turn receives the song requests from the devices also wirelessly. The player can connect simultaneously up to 256 such devices including the CAVS E-Songbooks. Imagine "No More Paper Songbooks" and "No More Request Slips" for a paperless karaoke night. The devices can also create and save the Favorite Lists and show the reserved songs in Queue. CAVS PlayCDG KJ Deluxe 64 LT now has a new feature Interlude that automatically plays your choice of music in-between karaoke songs. This feature is requested by the hosts who want to avoid the awkward silences. Also for setting the values of key, tempo, and customer name for each reservation, popup windows are now available for easy inputting. This feature is optional and can be selected in the Setting. For those who wishes to purchase CAVS PlayCDG KJ Deluxe 64 LT program together with a laptop or Touch Screen All-in-one PC, please go to CAVS Laptop Karaoke Players. In the packaged players, CAVS PlayCDG KJ Deluxe 64 LT program comes pre-installed and show-ready. For those who already have a laptop or PC with Windows 7 64bit system, you can purchase the CAVS PlayCDG KJ Deluxe 64 LT program online and download. For help on installation, please read the How To Instructions below or see the instructional videos in Youtube. Dual Screen Karaoke - Laptop display, PC monitor, or Touch Screen monitor will display the KJ Control Panel which is now switchable to the 3D Customer Interface. A separate TV screen will display the song lyrics with coloring for sing along..
- Simple and intuitive interface that can replace the KJ Control Panel for direct customer access. Play CD+G, MP3+G, MCG, NCG, Super CD+G, ZIP, AVI, WMV songs from the hard drive. Extract CD+G and Super CD+G discs into the hard drive. Search for songs by Index, Title, Singer, or File name. Support all international fonts (English, Russian, Spanish, Chinese, Japanese, etc.). Easy loading of song data and song list management. 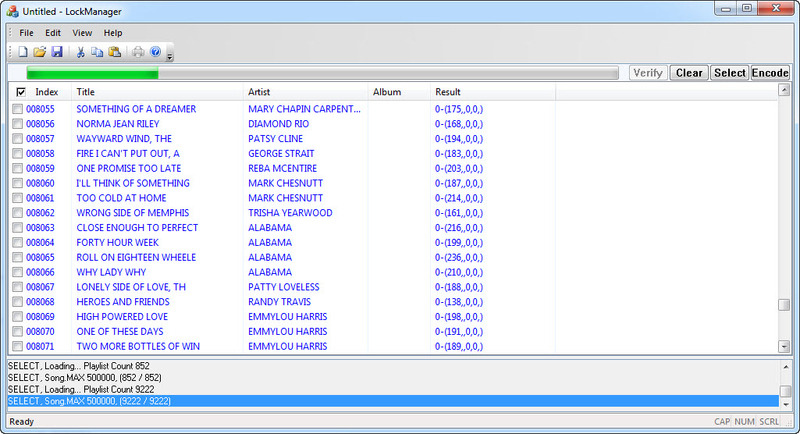 Encrypt the song content inside the CAVS Karaoke player using CAVS Lock Manager program. It comes with a USB Key Lock to protect the song contents from unauthorized copying and exporting out of the player. Select any Playlist inside the CAVS Karaoke player and press Encode. All songs listed within the Playlist will be encrypted for protection. You may encrypt all or a part of the song content. USB Key Lock is sold separately. Before purchasing PlayCDG KJ Deluxe 64 LT program, please download the demo version for free of charge from the following link. Select Save to save the file in your computer (for example, in the Desktop). When the download in completed, select Close. Go to the folder in which the download file is saved (for example, in the Desktop). Right click on the downloaded file �PlayCDGKJDeluxe64LT_demo.zip� and select Extract Here. After the extracting, you will see a setup file (among others) in the same folder. Double click (left clicks) on the setup file to begin the installation. Follow the instruction given to complete the installation. Start the program and it will come up as a demo version. Please make sure that this demo version works properly in your laptop or PC. Your laptop or PC may need to install the following programs for the proper running of PlayCDG KJ Deluxe 64 LT Demo program. Please refer to the following video instructions on proper installation of PlayCDG KJ Deluxe 64 LT. Please refer to the following graphic instructions on proper workings of PlayCDG KJ Deluxe 64 LT.